See our newest custom designed brush product in use! 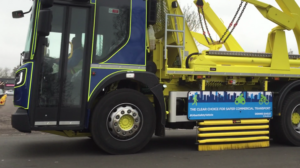 Widdops Brush are proud to be part of the innovative new DawesGuard™ technology system, providing the custom designed brush plates at the base of the DawesGuard™ making contact with the road surface at all times whilst the safety apparatus is deployed. Most serious and fatal accidents involving heavy vehicles and cyclists or pedestrians, happen when the vulnerable road user fall under the vehicle and is run over by the rear wheels. Widdops worked with Dawes Highway during the prototyping of their new patented fully retractable DROP-DOWN® Safety System which prevents the vehicles wheels from passing over any person on the ground.